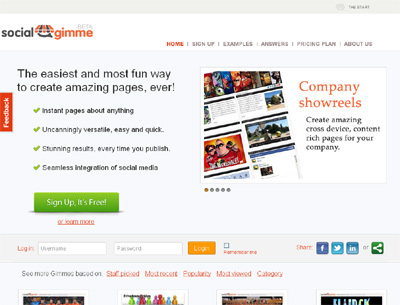 SocialGimme enables people and companies to create amazing magazines, pages, blogs, pamphlets etc with lightning speed. Even that hardest things to do for most people, like embedding a facebook likebox, facepile or comment box are single click enabled. Every bit of content can be added in the easiest way possible. No tech skills or coding required, just a creative mind and an interesting subject. Every Gimme page looks stunning on a desktop, a tablet and a smart phone. One has to try it to experience it’s incredible speed and usability. Also, we allow our users to advertise and monetize their Gimme pages with Adsense, coupons, banners etc. So, we are about creating engaging content, attract an audience ( on the socialgimme wall ) and monetize it. Pretty soon, we will launch our Facebook app as well, where we offer an alternative for the much dreaded removal of the static fanpage.